Stephen O'Connor Author. His historical non-fiction book, "Orphan Trains," was about the 250,000 homeless children transported out of American cities and placed with families in the rural West from 1854 to 1929. Keith Donohue Novelist and book critic. He is the author of "The Boy Who Drew Monsters," "The Stolen Child," "Centuries of June," and "Angels of Destruction." Janice Nimura Author and book critic. Her book "Daughters of the Samurai" is a non-fiction account of five young girls sent in 1871 by the Japanese government to the United States to learn about American culture. Excerpted from “Orphan Train,” Copyright 2013 by Christina Baker Kline. Reprinted with permission from Harper Collins. All Rights Reserved. MR. FRANK SESNOAnd thanks for joining us. I'm Frank Sesno of the George Washington University and Planet Forward sitting in for Diane Rehm. She's on vacation. 17-year-old Molly Ayer is just about to age out of foster care when she steals a book from the library. Her punishment is a community service project to help a 91-year-old widow clean out her attic. And as Molly gets to know Vivian, the 91-year-old, she realizes that they actually have a lot in common. MR. FRANK SESNOBoth were abandoned as children and grew up with foster families. Joining me in the studio to talk about "Orphan Train," a novel by Christina Baker Kline for this month's Reader's Review, author Stephen O'Connor, writer and critic, Janice Nimura and novelist Keith Donohue and welcome to you all. MR. STEPHEN O' CONNORThank you. SESNOThank you so much for coming in. This is a fantastically fascinating book, disturbing in some levels, riveting in many others and inspiring in still others. Stephen tell us about these orphan trains because we'd like to know, I'd like to know, how it started and how long it last and in some ways, you're responsible for all of this because of the book you wrote 10, 15 years ago. CONNORI played a very small role in all of this, but the orphan trains -- first of all, they weren't called orphan trains during the entire time that they were done. That was something that came into use much later. But in any event, they were the brainchild of a guy named Charles Loring Brace, who was essentially a social worker in New York in 1853. At that point, there was -- for the first time in America, we had these absolutely terrific amount of poverty. CONNORThere was 1,000 people a day were immigrating to New York. We were in this transition from a (word?) crafts and agricultural economy to an industrial economy and there were just tons of people living out on the street, including, according to the estimate of the police chief in 1849, 3,000 children who were living on the street. The way America was dealing with these poor children was simply to put them into what amounted to juvenile prisons. CONNORThey called them houses of refuge or juvenile asylums, but they were underfunded and they were really fundamentally prisons. And Charles Loring Brace, you know, sort of looked at this situation and he had this idea that, you know, these sort of radical ideas that are now the foundation for child welfare, which is, first of all, that just because a child is poor doesn't mean the child is a criminal and second of all that children are better served in families than they are in any institution. CONNORAnd so he started the Children's Aid Society to help these poor children. He established the first runaway shelter, which he called the Newsboy's Logging House. He created schools for poor kids who were embarrassed to go to school because they were dressed in stinking rags and he developed what he called the immigration plan, which was he would take trainloads of kids, send them out to the country where they would sort of get off at a platform and go to a meeting house, a church or a grange and people would choose among the children. But they would just take them home. SESNOPeople would show up, check the kids out. SESNOAnd what were -- and were they looking to these kids to round out their families, to adopt them because they were childless or were they seeing these kids as child labor. CONNORAll of the above. I mean, one thing, though, that people don't understand is that in the 19th century, almost every household had a -- there was a member of the family who was not really a member of the nuclear family. Often, they were just -- they were servants, but they would be called members of the family. Very often they were poor relations, which we're sort of familiar with from, you know, Victorian novels. CONNORSo the idea of bringing a child into the family was not that radical so they -- some of the kids were adopted. Some of them were used as slave labor. Some of them became drunks and drifters and some of them became governors. SESNOLet me pull Janice Nimura and Keith Donohue in here. The book, the "Orphan Train," by Christina Baker Kline is a well-known best-selling novel, right? It's an historical novel about this relationship between this 17-year-old Molly Ayer, contemporaneously, and contemporaneously, this 91-year-old Vivian Daly who was up through and experienced the orphan train in many ways. So what did you think of the book? What did you think of the character and its role as a bestseller and with book clubs and all of that? NIMURAWell, I think there's something for many levels here. There are -- I think this book has become so popular, partly because it appeals both to parents and young adults. I know of a lot of mother/daughter book groups who've embraced this book. SESNOBecause it's intergenerational or because the characters are women? NIMURAThat, and because the character of the 91-year-old turns out to have a remarkable amount in common with this rather prickly 17-year-old and I think there are a lot of 17-year-olds out there who felt that, you know, we have more in common than you might think. I'm not just a kid here. SESNOWell, and then the book is actually written from both points of view, isn't it? DONOHUERight. That's the interesting thing to me is the structure of it, where you have these two alternating perspectives carrying forth the narrative. In the writing of it, the author was talking about trying to keep the balance between the two. I'm not so sure that that really happened. Vivian's story is far more dramatic and engaging. But there is that back and forth between the two perspectives that, I think, really carries that narrative forward. SESNODo you see great character development in either or both? DONOHUEI see it in Vivian far more than I do in Molly, yeah. NIMURAAlthough, it is, I think, something that Molly discovers that, you know, initially when she's sort of sentenced to do her penance with this old lady in her attic, she comes to realize that there's a lot more to the old lady, a lot more that feels familiar and very intimate than she could ever have suspected. SESNOKeith, why do you think this resonates so much? DONOHUEWell, part of it is that capturing of part of American history that has started to slip away. A lot of people had never heard of orphan trains. I, myself, I think the first orphan train story that I heard was on an old "Little Rascals." DONOHUERight. Have you seen this one? CONNORI see, okay. You're off the hook. DONOHUEBut, yeah, so there's an orphan train. SESNOThey don't call it that, though. DONOHUENo, they don't call it that, but there were orphans being sent to the Midwest and, of course, Our Gang, the Little Rascals somehow contrived to substitute for the actual orphans and they're sent West and hijinks ensue. You know, a kind of a light take on it, but really that sort of capturing that nostalgia and that slipping away of this episode in American life, the timing is perfect for this. SESNOI want to remind out listeners that you can be part of this conversation about Christina Baker Kline's "Orphan Train." You can do that on Twitter and Facebook by using #drreads. We'll be using some of your comments on the air. Certainly you can call us at 1-800-433-8850. In a few minutes, later into the show, we'll bring you into the conversation. Stephen, Keith was just talking about the sort of evocative things in history. SESNOAnd there were many things in the book that I connected to, certainly to the characters, certainly to their plight as abandoned children. That's sort of gut-wrenching by itself. The generational tug is fascinating to see. But I loved some of the historical referencing. So there's this whole part of the book that's built around Nielsen's General Store, right, and this notion of that simpler time in America when there was the general store and I just sort of found myself kind of imagining what it would be like to kick around a general store. SESNOI found that remarkably evocative. Were you pulled in some of these historical components to this book as well? CONNORI was pulled to some extent. I mean, of course, I'm much more familiar with that era so it wasn't so new. I mean, what really actually struck me was that Christina does something that I also did in my book, which is I used the story of the orphan trains to talk about contemporary foster care. And so the thing that was really interesting to me was the relationship between relationship between Vivian and Molly's experience. CONNORAnd, you know, as she shows, I think it's very accurate, there are many, many of the same problems, you know, affect kids in foster care right now, including the fact that they're given no respect, you know. They are kind of seen as criminals and, of course, there's a tremendous lack of supervision as well or incompetence of provisions. So those are the things that really engaged me in the book. SESNOSo the dynamic around Molly, the 17-year-old, is that in her foster family, her foster mother has not use for her. There's all kinds of conflict there. The father is kind of a background figure. I mean, he's sympathetic, but sort of a milk toast to put it mildly. But there's a financial benefit for the family and that seems to be the ulterior motive here. And you're saying that this is what -- among those things that raised questions and problems about the contemporary foster care system. SESNOSo the orphan trains, people who took the kids were not paid? CONNORNot in the early days, no. SESNOBut they got the labor. They got the child labor. It effectively was payment. CONNORThey got the labor. Yeah, yeah. SESNOI mean, there was no financial or cash value. CONNORRight, right, right. No, there was that, I mean, you know, again, it was a very common thing. I mean, one thing -- there's a poem from the 19th century that maybe inspires the comic strip "Little Orphan Annie" and it goes "Little orphan Annie came to our house today to stay, to wash the dinner dishes up and put them all away." And that's what was expected of orphans in those days. SESNOIt was a transaction, Janice. NIMURA...arrives at her first placement in Minnesota, she arrives at a home where there's basically a sweatshop in the house making women's dresses. And she comes in as the only person in the room who's not being paid. And it's very clear that the quote/unquote "parents" who have taken her on have seen this as an opportunity to have one more pair of hands in the sweatshop that they don't have to pay for. NIMURAAnd they make it very clear that she is only there for that purpose. They make her sleep on the floor in the hall. They padlock the refrigerator. They make it very difficult for her to be part of any family. SESNONo fun being a child. You're listening to "The Diane Rehm Show." I'm Frank Sesno. Coming up, more on the "Orphan Train." SESNOWelcome back to "The Diane Rehm Show." I'm Frank Sesno, sitting in for Diane today. We're talking in our readers' review about "Orphan Train," a novel by Christina Baker Kline, speaking with three remarkable people who are weighing in, and we're going to invite you to do that. Don't forget, you can be part of this conversation on "Orphan Train," Twitter, Facebook, by using #drreads, or you can call us and jump on with us in the conversation at 800-433-8850. We'll get the calls in just a moment. SESNOIn the studio with me, Stephen O'Connor. He's an author. His book, "Orphan Trains," is a nonfiction account of the more than 250,000 children sent from American cities to the West from about 1854 up to about 1929. His next novel, "Thomas Jefferson Dreams of Sally Hemings," will be released this spring. So we'll find a moment for you to tell us about that before we're done here today, Stephen. Janice Nimura, she's author and a book critic. Her book "Daughters of the Samurai" is a non-fiction account of five young girls sent in 1871 by the Japanese government to the United States to learn about American culture. And Keith Donohue, he's a novelist and a book critic, as well. He's author of "The Boy Who Drew Monsters," "The Stolen Child," "Centuries of June," and "Angels of Destruction." Have you got another one you're working on now? SESNOWell, do you want to -- we're going to let you tell us about that, too. So we'll have a chance for everybody to talk about their books. I won't do that, but we'll let you do that. One of the things, and Keith, let me let you start with this, that Christina Baker Kline conveys so clearly through this very creative, intergenerational conversation throughout the book, is how dramatically childhood itself has changed, how it was viewed in the -- at the time of the Depression and how it's viewed now. How did you see that? DONOHUEWell, certainly the role of the child and the family has changed, where we were talking earlier about using children as labor, and I think that was actually more prevalent in the 19th century, leading into the 20th century, with all the social changes that happened. So it became a case where the idea of a child really has changed from a small adult into this person that we take care of, we hover over, we -- and in this particular instance, in Molly's case, she is still, you know, caught in between those two worlds, in between treating the child as a small adult and this more sort of beneficial relationship. SESNOJanice as a book critic, thinking about these different themes that we've raised here and the characters, this sort of complex weave here, how do you -- how do you assess this work? SESNOBig question. Take it wherever you want. NIMURAI liked all of the echoes and resonances that bounced between the two stories. I think this is a book that is very plot-driven. There is less sort of lingering over lush sentences than sentences in the service of a story, a story that drives forward like a train. But there are wonderful echoes, the necklaces that Molly and Vivian both wear that contain charms that mean everything about who they are in the world regardless of what their context is at any given stage, all of the renaming that happens. You know, that to me, having written about Japan, was resonant also. In Japan, whenever you hit a new life stage, you often get a new name, a new sobriquet. NIMURAAnd also the way -- the big lesson, which is when people feel moved to give you something, try to see it as a gift and accept it, whatever it might be, and use it to move -- keep moving forward. SESNODid you feel a tradeoff here between the pacing, which is pretty quick, and the depth, which in some cases is withheld of some of these characters? NIMURARight, I mean, there definitely were moments where there was definitely, like, a little flag would go up and say, you know, historical context here, and we would get a little pause and a little tour through, say, the general store that you mentioned and all of the products and the slogans and the storefronts and the signage, and so you could sort of see that there was serious research behind the story, and this is where you were getting it. NIMURAAnd then it would -- you'd move back into the lives of these characters. SESNOStephen, how historically accurate is it? MR. STEPHEN O'CONNORWell, it's a complicated question, partly because a lot of the records for that era are very sketchy, and it really is a matter of interpretation. But I would say that in the larger sense, it's quite accurate. There's a little bit of a chronology problem, which is to say that in the early days of the orphan trains, the parties of kids that would go out would be about 30 to 100 kids who'd get sent out. But by the turn of the century, that is the 19th into the 20th, there are more like sort of two to 30 would go out. And by the time that that is -- that this book takes place, they were much smaller, like five orphan trains. And in fact the very last one went before the one that this one is about. MR. STEPHEN O'CONNORSo -- but in terms of rendering the experience of people who went out and sort of -- on the classic orphan trains, it's quite accurate. And, you know, and I think that's what she was trying to do. SESNOFor me, the hardest scene was the scene where Vivian, when she was a child, and being called Dorothy among other things, is handed over to this one family, the Groats. SESNODestitute, sort of Dust Bowl-type family, poorly educated, dad's not really working, the kids are in rags, the mother is mostly bedridden but not bedridden -- implied is some kind of mental illness perhaps. And then there is the terrible scene, of course, where the father, the Groat, attempts to sexually abuse the child. How resonant is that in the orphan train experience, this notion of child abuse and sexual abuse, which is a persistent theme? O'CONNORI can speak to that, yeah. That was very common. It was very common for women in general. I mean, you know, of servants there was a common expectation that female servants were sort of -- would offer up sexual favors to the man of the house. When I was doing my book, I spoke to a number of women who had been sexually abused, and I kept their names secret, but they -- you know, it happened a lot. O'CONNORAnd one of the women I spoke to said -- you know, I said, what did the wives think about this? And she said to me, oh, everything was different in those days. She says, in those days, the wives just wanted to keep their husbands off their backs, so they were happy that this young woman would come into the house. But in any event, for whatever reasons, that was quite common. SESNOKeith, how did you respond to that? DONOHUEWell, that was a tough scene, right. The -- I think the other tough scene in the book is the fire at the beginning and the loss of her original Irish family. I'm not so sure about the history, or the historical accuracy of it. That I wouldn't know, although I do have a real quick story. The -- my day job is at the National Archives, and I was looking through census records, and my great grandfather, I guess it would be, 1840, has a wife, some children, and the female servant. The next 10 years go by. The servant's now the wife, the original wife is gone. So I think this kind of thing happened fairly frequently with, you know, the dynamics of the family change because of the nature of small-town life, really. SESNOYou talk about the archives, which is where you work. It's interesting. I have an email from Jim in St. Louis, and maybe somebody here can help him. I have three people in my family who were on orphan trains. I'd like to add them to a database or some kind of list. I can't find any place that's started to collect that information, though. Do you have any ideas? Is there such a database? Does such a thing exist? Any ideas or guidance for Jim? O'CONNORThat's right. Yes, that's a good place. SESNOWe're going to go to our calls, and there are several of them, and remind you again that if you want to join us by phone, 800-433-8850, or you can drop us a note @drshow@wamu.org. Or be part of the conversation on Christina Baker Kline's "Orphan Train" on Twitter, Facebook, by using #drreads. So you have any number of ways to join the conversation. SESNOJanice, I'd like to ask you, though, to read a couple of paragraphs from the prologue for those who haven't read this book. It sort of -- it sets the tone and offers the style. NIMURARight, with pleasure. This is the voice of Vivian in the present. So this is 91-year-old Vivian, setting off -- setting the tone. "I believe in ghosts. They're the ones who haunt us, the ones who have left us behind. Many times in my life, I have felt them around me, observing, witnessing, when no one in the living world knew or cared what happened. I am 91 years old, and almost everyone who was once in my life is now a ghost. Sometimes those spirits have been more real to me than people, more real than God. They fill silence with their weight, dense and warm like bread dough rising under cloth, my gram, with her kind eyes and talcum-dusted skin, my da, sober, laughing, my mam, singing a tune. NIMURAThe bitterness and alcohol and depression are stripped away from these phantom incarnations, and they console and protect me in death as they never did in life." NIMURARight. But I think, you know, she's talking about when people die, you -- you're able to remember them in their best incarnations. I think Christina Baker Kline does a wonderful job of not making everybody black and white in this book. It's not hero Vivian and all of the evil transgressors who fell into her path. I mean, even that terrifying scene with Groat and his assault, the more -- what you also learn about Groat is that he, too, is a victim of circumstance and crushed by his own poverty and his own brood of children that he didn't want. NIMURAAnd without taking any of the horror away from what's happening to Vivian, you do -- you are invited to feel sympathy on and empathy on many levels. SESNOOh no, there's this pathetic thing that happens in that scene, where he just wants warmth and comfort, he says. I mean, you know, he -- it's not perceived from his perspective, at all, the violation that it really is. Keith, I wonder if you would talk a little bit about the writing style and Kline's writing style here and how you feel that works. DONOHUEWell, I think we said -- talked about before how it's a very straightforward, plain, good, honest, American style that is something like eating popcorn, where you kind of keep going, but it's certain plot-driven. I was struck by her evocation of the Irish life and, you know, just listening to that prologue again and the notion of, you know, well, the alcohol and the depression are gone, and so now those folks are all right. You know, I think that she does certain things very, very well. DONOHUEBut you can see why it appeals to a broad audience, that there's not a real challenge in the style, there's not a real challenge in the plot, and more power to her. SESNOStephen, it's really the scope of history, from Depression to current, is a fascinating, a fascinating period of time. And so to read the historical connections is part of this compelling story. O'CONNOROh absolutely. I mean, I think that -- of course with fiction in general, you know, we -- it works in terms of just the actual sort of historical information that it gives us, you know, about the particular period of time. But at the same time, it's also metaphorical for our own time. And, you know, what we see in the struggles of these people of a different era are, you know, not unlike our own struggles in our own lives, and I think that that is another reason why it's so appealing. SESNOI'm Frank Sesno, and you are listening to the Diane Rehm Show. And we are talking today about "Orphan Train," a novel by Christina Baker Kline. I want to go to the phones now and invite our listeners into the conversation. So Carly is joining us from Alexandria, Virginia. Hi, Carly, and thanks for being patient and standing by, and tell us what's on your mind. CARLYYes, hi. My great grandmother was an orphan in New York City. She was born in 1899. And I know that she spent a lot of time with the Sisters of Charity, a Catholic group. And I also know that some of her contemporaries, the children, were put on orphan trains, I think around the age of five, six, seven. But my great grandmother was not. She stayed in the home much longer than normal and then was put into foster care in New York. CARLYAnd I found out later she was Jewish, and she hid her identity as an adult. And I was just wondering, historically, was there any sort of vetting who went on the orphan trains? Would her Jewishness make her less desirable? Because she was put into foster care with two other children, and one of them, his name was just Boy, and so they were sort of, I think, not politically correct, but they weren't the cream of the crop is how I understand it. CARLYSo I just, I was wondering if there was any information about that. SESNOIt's a great question, and I'll ask Stephen to weigh in because in the book, her Catholicism is seen as a detriment. So they were more than not aware, right? 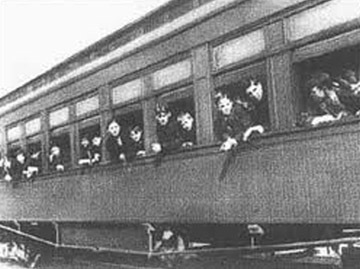 O'CONNORWell, I will say one thing about the orphan trains, which is that by around 1900, they really were beginning to shift into what they -- all the organizations that sent orphan trains out are now child welfare and foster care agencies, and that was happening. So it was very common that people were not sent far away in trains. In fact, it was the exception. Certainly by 1929, there were only five states that accepted orphan trains. So your grandmother's treatment was normal in that regard. O'CONNORThe number of Catholic organizations were set up because they perceived the Children's Aid Society as being a Protestant organization with its primary goal to convert Catholics to Protestantism. I doubt that that was ever true, but nonetheless, the Catholics were very worried about that, and so the New York Foundling Hospital was the first organization to send out orphan trains of just Catholic kids. But they often took Jewish kids and converted them to Catholic. SESNOJanice, it's interesting that Catholicism is a thread through the book. Niamh's red hair and freckles, her appearance, is a theme through the book and seen as a weakness, a detriment. NIMURARight, I mean, I think for her experience and for many of the kids that traveled with her, their ethnicities were systematically erased. The kid of German origin, who becomes important to her, who is known as Duchy, becomes Luke, and she's astonished to discover in late life that the little boy that she rode the train with named Carmine, who she assumed would get a new name the moment he got to a family, remained Carmine, and she was kind of astonished that this piece of ethnicity was allowed to remain. SESNOComing up, your calls and your questions for our panel and for our distinguished guests on the subject of Christina Baker Kline's "Orphan Train: A Novel." SESNO2001. Janice Nimura, she's an author and a book critic, as well. Her book, "Daughters of the Samurai," a nonfiction account of, yeah, the five young girls sent by the Japanese government to the United States to learn about U.S. culture. And Keith Donohue, a novelist, works at The Archives, as we've established, author of the book, "The Boy Who Drew Monsters," "Stolen Child," "Centuries of June," and "Angels of Destruction," with another on the way. And we'll talk about that in due course. SESNOBut I do want to go back to the phones now. And Karen joins us from Virginia. Hi, Karen. KARENHi, how are you guys? SESNOVery well. Thanks so much for calling. KARENThanks for taking my call. I'm a history teacher and sociology teacher. And when I was in college, I found out about the orphan trains, 20 years ago or so and just had no idea. And even today's history books really don't mention them at all. And I just think it's such an important social movement. But I didn't know if you guys knew the PBS "American Experience" did a episode on the orphan trains. And they have survivors that spoke of their experiences and photographs. KARENAnd when I share that with my students, they just -- one just can't even believe that this type of thing happened, where a train would just pull up and people could take children home. But they were also just amazed that, you know, the idea of being an orphan was such a stigma, especially out the western parts of the country where everyone could really trace their origins back. And hearing some of the first-count survivors, by the time the show is over there's not dry eye in the classroom. And I just think this is such an important movement to bring out to more people. And I'm really glad this novel was being written and that your book was written, as well. SESNOWell, I couldn't agree with you more, Karen. Thanks very much. And, Stephen, I wonder if you'd talk for a moment -- before the show, before we went on the air you were talking about how you got into this and how you met, essentially, someone who took your breath away. And I wonder if you'd recount that because I think it's quite fascinating. O'CONNORSure. I mean, one of the people who made that film, Janice (sic) Graham, was a friend of mine. And I had written another book, a nonfiction book, about poor kids. And she said, you should write a book about the orphan trains. And so I said, no, I'm busy. I've got a novel I want to work on. And she said, no, no, no. Come see what I've got. So I went to her house and she showed me this handwritten journal from 1857, in which an agent for the Children's Aid Society had gone around and interviewed street kids. O'CONNORAnd then he wrote down their life stories in dialect. And I read one of those and I was so staggered that for the first time in my life, the one and only time in my life, my breath was actually taken away. I couldn't speak for a long time. And then finally I said, okay, I'll do it. O'CONNORWell, I think, actually, the truth of the matter is I thought, as a writer, this was a real gold mine, but also it connected to -- I'm very interested in the way the -- America treats poverty. And in particular poor kids on all kinds of levels. And so I just saw that there was a great story to be told there, where I could, you know, explain some of these things that were really -- I felt passionately about. SESNOAll right. Let's go to Harry, who joins us from Missouri. Hi, Harry. HARRYHi. I've got a friend who wrote a song called, "Orphan Train." I'm a musician here. And he grew up in Memphis, in the early 1950s. He's a compassionate person. And he has a song called, "Orphan Train." And I heard this program. I had to listen. And it's -- I'd like to -- for him to be able to share this. If you could send -- if I could send it to you or if anybody's interested in a song called "The Orphan Train." It's really a good production. SESNOAnd it's about these orphan trains that we're talking about? HARRYIt's a good song. I appreciate you taking my call. SESNOAll right. Well, thank you, Harry. And you have a great day. Let's go to William, from Michigan. Hi, William. WILLIAMYes, good morning. This story resonates with me because of my wife's family's experience with the Catholic Church and being orphaned mysteriously back in the 1800s in Brooklyn. It was either Fife or Moral, I'm not sure which. And a young boy was shipped off to the Midwest, indentured to a farmer. And he was told that when he was 16 he'd get a mule and his freedom. The farmer beat him until he left at 14. He -- needless to say, he gave up Catholicism after that experience. SESNOYeah, this is something, Keith, that is -- that we see in this book a lot, this leaving, these terrible conditions that these kids endure and figuring out how the heck do I get out of here. They're not empowered. They don't have advocates. And they were, really, a very young age, on their own. There's this one character in this book, Miss Larson, who is -- who befriends young Vivian. But that's about it. DONOHUERight. The teacher, when she's in her second home, befriends her. And the landlady who -- Mrs. Murphy, who runs the boarding house, is also sort of an advocate. And that's kind of the real turning point of the book, where -- or one of the turning points of the book, where she is rescued from this disorder, from the Groats family. And then through this transition ends up with the Nielsens and the more orderly, conventional Midwestern life. SESNONo childhood. All right. Gwen joins us from Michigan. Hi, Gwen. GWENHi. Thanks for taking my call. GWENI'm a mother, a grandmother and I'm also a therapist. And I read the book and loved it for its simplicity, both in spite of its simplicity, but also because of it. You were talking about the echoes that attract, particularly the teenager Molly. And as a therapist I see a lot of alienation in teenagers. And, you know, whether it's lower-income teenagers that are actually living on the street, transgender teenagers, just kids who dress differently and aren't appreciated because of their difference, but also kids in, you know, middle class families. GWENI just see a lot of parents working two jobs and just not around very much. And so I think some of the echoes that attract teenagers to this book is -- are the echoes about their own sense of kind of being left alone and kind of being alienated and, if they're different at all, not really finding a place to fit in. And the other thing I guess I wanted to comment on is as a therapist what I think is a wealth of a way to deal with this currently in our society is putting elders with younger generation kids in a lot of different ways. I like this idea of the book clubs and those kinds of things. GWENBut I think that our -- in our own culture today we still have abuse and we still have alienation and we still have foster care that really is not a very well run, you know, establishment. And kids who are -- go from foster care to foster care. So I think those are the echoes that, as a therapist and as a grandmother myself, that I see are still kind of present in our own culture that draw us in. NIMURAAnd they take two very different approaches. That's one of the echoes I liked best. This is a great question. For Vivian, who's really just trying to survive. I mean, she has really come to the edge of death a couple of times by the time she reaches safety. And once she reaches safety, she is completely focused on fitting in, on passing, on not rocking the boat, on minimizing risk so that she can stay safe for as long as she can. NIMURAThen you fast forward to Molly today, who copes with her own sense of not fitting in by sticking out as much as she can. She's a Goth, she's got skunk stripes in her hair, and piercings all over her face. And she wears crazy clothes that she doesn't feel particularly comfortable in, but she sees them as some kind of a shield that keeps people from asking questions about finding out who she really is. NIMURAAnd then the lovely, sort of dance of the book is that, as these two women get to know each other, Vivian sort of comes out of herself a little bit and Molly relaxes and starts to put away some of her costuming. And they reach a plain where they're both standing and regarding each other almost as equals. SESNOIt's a very, very interesting dynamic. This notion of fitting in has always been a challenge, of course. It seems to become more of one when society becomes so complicated. Tim joins us from Ohio. Tim, thank you for being so patient and waiting. Go ahead. TIMMy wife and I were foster parents for 60 infants and toddlers awaiting adoption. TIM…we adopted one who's getting married August 14th. She's 28 years old. TIMAnd we're so proud of her. SESNOWhat a wonderful thing you've done. SESNOI have a -- not to interrupt, but my hunch is both of you are incredible if you're going to do that. But go ahead. TIMWell, thank you. Thank you so much. But here's the thing, I'm reading the book and I get that point where she gives the baby away. And I almost -- I slammed the book shut and I said, Vivian could not have done this. I found it a complete character shattering disbelief that she would do that. And it took me a whole day to talk myself into picking up the book and finishing it, you know. I don't know if your consultants are -- were that shocked by it, but I certainly was. And it was really hard for me to get back into the book, but then I'm glad I finished it because it is a great book. SESNOWell, it's wonderful that you raised the point and wonderful what you've done with all these children. And I'm gonna ask Keith, without spoiling it too much, to offer your thoughts on that moment where Vivian gives the baby away. DONOHUEYeah, of course this is when she's a young adult and there are reasons in the text itself for doing so, but the -- one of the challenges of the book, I think, is how quickly it ends. We're taken up to this point of her reunion with one of the fellow passengers on the orphan train and she pretty much cuts the story off at that point. From a structural novelist point of view, that is kind of a shock. SESNOYeah, we sort of time travel, zoom. SESNOI think it's about a page and a half. DONOHUEExactly. Between 20 and 91 nothing happened. So I empathize with that reader. O'CONNORI mean, it's a different time. But at the same time, she's consigning her baby to the foster care system. And there are wonderful people involved in foster care. O'CONNORAnd repeating, right. But and there are also people, as we hear, alas, in the news headlines all the time, who are not so wonderful. And so it is a rather frightening moment. And I think it underscores how afraid she was to love. And especially after her Dutchy (PH) had died. SESNOJanice, what did you take away from the book? NIMURAI like this idea that overlays the book about portaging. This idea -- it's sort of a main Indian idea of carrying your canoe to the next water source. And you can't carry everything. So what do you take with you from one phase of your life to the next? SESNOKeith, what did you take away? DONOHUEThat's a good point that I hadn't thought of. My takeaway was more the question of the historical truth of the orphan train. SESNOVery quickly. Our last call goes to Sally, from Little Rock, Ark. Hi, Sally. Go ahead. SALLYHello. Thank you. I have chosen this book for my book club in September. And so it is certainly a gift to hear, you know, it discussed. And it's been about six months since I read it so I don't have total recall on everything. I had seen a documentary on an orphan train and it just -- it was just hard to even realize in my life and in my day and time that something like that could have happened. But I wonder if your panel -- this will be so exciting for them to know that I was able to speak to you all. Does the panel have anything I can express to my book club? SESNOGreat. You've come to the right place for a tutorial. Quickly, Janice, you want to lead us off? SESNOA question or something to throw on the table? NIMURAI think you should recreate the research project that Molly does at the end of the book and ask people what they would take with them. DONOHUEYeah, I would dig back into the back story of the main characters. O'CONNORAnd I guess I would say I would take it forward and see the connection between the past and the present. SESNOAnd if I can play, I would throw -- I would suggest discussing theme of fitting in and what that means and how that has changed through time. I promised at the outset that I would let each of you talk a little bit about your books. So now comes the time. Keith, what are you working on? DONOHUEMy new novel is called, "The Motion of Puppets." It's about the Orpheus and Eurydice myth, set among puppets. SESNOWhen is this going to come out, do we think? DONOHUEProbably a year or so, yeah. NIMURAOh, well, my book just came out two months ago. So I'm talking about the one that is, rather than the ones to come. SESNOOkay. Well, you can talk about that. NIMURA…it's a book about five girls who were sent here by the Japanese government in 1871 to grow up American and then enlighten Japan. NIMURAYes. A Japan at the -- in the late 19th century that was urgently trying to catch up with the rest of the world. NIMURA"Daughters of the Samurai: A Journey from East to West and Back." O'CONNORMy next book is called, "Thomas Jefferson Dreams of Sally Hemings." And I think the title pretty much explains what it's about. It's coming out on April 5th of 2016. And it's a mix of realistic fiction, decidedly unrealistic fiction. Thomas Jefferson's an ape in some sections of it. And some essays and so forth. SESNOThomas Jefferson is an ape in some of it? O'CONNORHe's an ape, he's a blimp, he's a statue, he's dead a lot, but alive at the talking of it. O'CONNORThere's also -- there's a lot of, I mean, it's -- the anchor of the story are the realistic sections, which are the majority of it. SESNOIt sounds fascinating. Well, it's been absolutely wonderful having all of you here to talk about "Orphan Train," by Christina Baker Kline, which I found to be quite a moving and very effective piece of work. For our next Readers' Review, you want to miss this, "Go Set a Watchman," by Harper Lee. You've heard so much about the mystery surrounding its publication. You've read the reviews. We'll give you a chance to weigh in, join the discussion on Wednesday, August 26th. "Go Set a Watchman." To our panelists, Stephen O'Connor, Janice Nimura, Keith Donohue, thank you all very much. SESNOTo our author, Christina Baker Kline, thank you so much for what you have done. To those who joined the conversation by phone, thanks to you. I'm Frank Sesno sitting in for Diane Rehm. Have a terrific day.